IslayBlog.com - 04/Sep/2006: The Oa to become Special Protection Area? IslayBlog.com -> 2006 -> The Oa to become Special Protection Area? The Oa to become Special Protection Area? The BBC reports that The Oa could soon be designated a Special Protection Area (SPA). Main reason to award this status would be the choughs (a type of crow) living in the area. I've been on The Oa several times, the last time in April 2006 in fantastic weather. During those visits I've seen quite a few choughs, in particular during walks with Gus Keys from the RSPB on The Oa. Not to forget a variety of other wildlife. 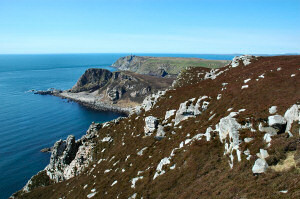 The BBC report doesn't mention the RSPB though (despite the RSPB reserve on The Oa), but only Scottish Natural Heritage. Is that the reason why they are using a picture of Port Ellen from Undiscovered Scotland instead of a picture from The Oa? I could have given them a few (e.g. the one in this entry) or they could have tried RSPB Images.